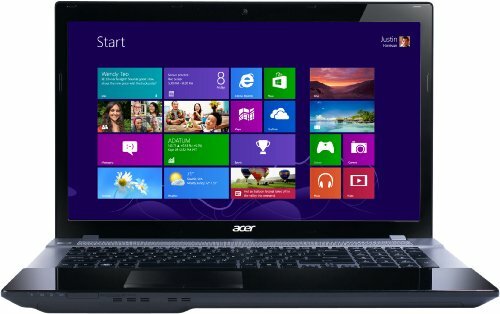 Below is our review of the Acer Aspire V3-731, a 17.3" laptop, featuring 6GB RAM, 500GB hard drive and Windows 8. So you're after a larger screen laptop but have a relatively small budget to play with? Here we look at one of the less expensive 17.3" display notebooks, manufactured by Acer as part of their Aspire range. Finished in black, and fitted with the Intel B960 processor, it features an exquisite design, with clean sharp black edges contrasting with the partially silver interior. In short this notebook has the appearance of one costing more than it's modest price tag. Now first we will address the downsides of having a larger screen - as mentioned previously, typically it will feature a lower specification than a similarly priced 15.6" notebook, due to extra costs in manufacturing. Similarly, it will weigh more than a smaller laptop, as well as have larger dimensions - bear this in mind if you are a frequent traveller. It will almost certainly have slightly less in terms of battery life - a larger screen requires more power to light up. Inside you'll find the Intel Pentium Dual Core B960 2.2GHz processor, which features a 2MB cache. When paired with 6GB RAM, both Windows 8, and any applications loaded, ran smoothly and without issues during our test period. In terms of storage Acer have provided 500GB - running at 5400rpm - which should be ample for the majority of users. Connectivity is catered for by a plethora of options: A Multi-in-1 card reader (with access for SD, MMC, MS, MS PRO and xD), Four USB Ports (two of which are USB 2.0, and the other two are USB 3.0), a VGA Port, a HDMI Port, an Ethernet RJ-45 port, a 3.5mm Microphone Jack, a 3.5mm Headphone/Speaker/Line-out jack, as well as a DVD drive and webcam. In terms of size and weight it measures 3.5cm by 41.5cm by 27.5cm, which isn't too bad at all. Weight is a touch above average at around 3.2 kg, and as such may be slightly too heavy for regular commutes. The 17.3" display is clear, and offers good definition, and the speakers also performed well during the test period. So overall, who is this notebook aimed at? Good overall specification, decent screen, attractive design. Quite heavy at 3.2kg - this might not be the laptop for you if you travel frequently. If you're after a larger screen laptop, and are on a budget, then you can do a lot worse than look at this Acer notebook. It may be slightly heavy, but for the money it's a pretty good deal.